It’s now possible to save products to your basket and return to them later on – allowing you to create estimates for jobs and projects you may have coming up. We’ve put together an easy to follow step by step guide to show you how to start saving your baskets now! 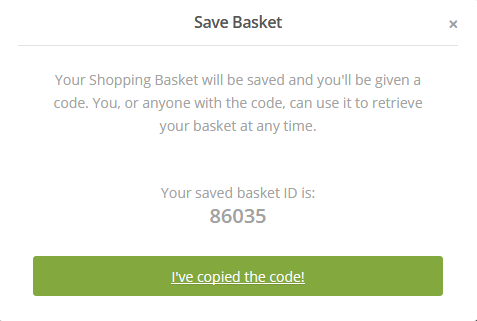 Step 4: Well done – your basket ID code has now been generated! Keep a note of your basket ID because you’ll need this to access the basket again. Once you’ve made a note of the number, simply click ‘I’ve copied my code’ to close the pop up window. Go to the basket page of the website and ensure that your basket is currently empty. You will then be prompted to enter your basket ID, which is where you’ll need the number you made a note of previously. Enter the number into the field and click ‘Bring my basket back’ in order to retrieve your basket. Go directly to the ‘retrieve a basket’ link. Follow the same procedure as above by entering your basket ID into the requested field and click ‘Bring my basket back’. It’s as simple as that! Just remember, that any items you currently have in your basket will be removed when you retrieve a saved basket. If you wish to add additional items to the basket after it has been retrieved, carry on browsing the website and adding to basket as you go.